My personal scan from Newtype 2006, february issue. From what article says, this girl must be Ai... right? This is Ai -Enma version, embracing Ai -child version. 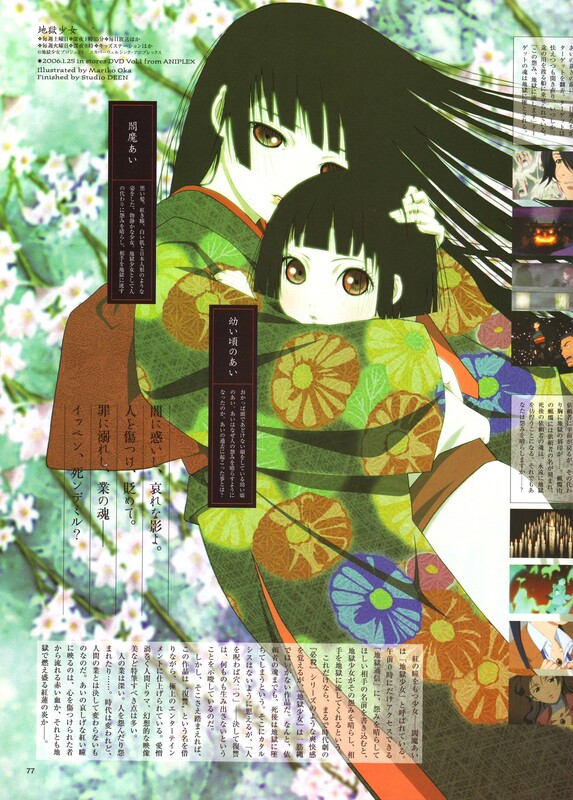 i really love jigoku shoujo's art, it's so beautiful! i just admire the style of the artist! ehhhhh~Enma Ai's already married? to who? to that journalist? the child.. isnt she the that appear on futakomori? Awwww! This picture is so cute! I'm guessing that's little Ai. To cute. Enma Ai's character design is so striking-- the haunting, red eyes and the straight, inky hair, her small hands and girlish body.